A cane is a great aid for getting out and about if you are blind or have low vision. People use white canes for a variety of reasons. 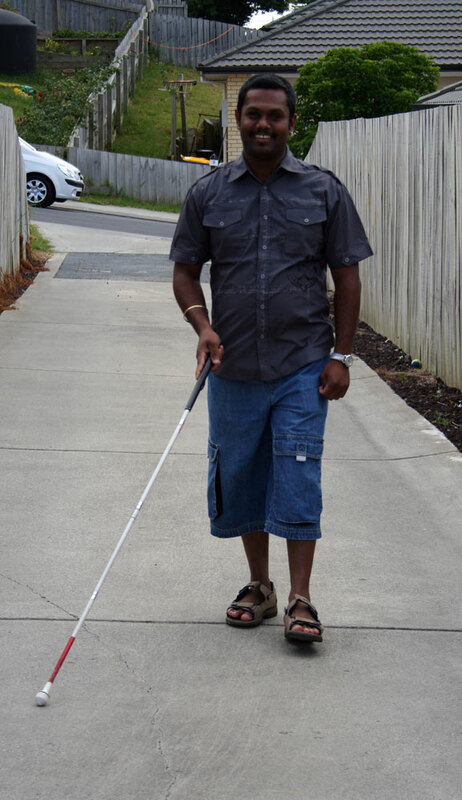 A lot of sighted people identify with a white cane being used for people who are completely blind, but people who have low vision also use them. After being trained to use a white cane, you will become more confident with where you can go and what you can do. If you or someone you know is interested in using a cane, the Blind Foundation recommends an assessment with one of our qualified trainers. They will teach you to use the cane most appropriate for you, safely and effectively. Not all canes are the same. There are different types of white canes and different techniques depending on the person and their environment. The Blind Foundation has three different types – the long cane, a shorter symbol cane and a support cane. All the canes are white and most have red on the bottom section. Long canes – using a long cane to check out your environment ahead, you will soon be stepping out confidently. It will check the path 1.5 to 2 steps ahead of you, so you will have warning about any obstacles, hazards or surface changes. The length depends on your height and walking speed. They come in rigid or folding models. Symbol canes – these are shorter versions of the long cane. These aren’t used for checking the area in front of you but to let people know you are blind or have low vision. They are about 70 cm long. Support canes – these are used for people with balance or support issues. They are not for checking the environment ahead. The Blind Foundation recommends an assessment with an OT or GP for anyone who has balance or support issues. We work alongside these experts to ensure you have the right mobility aid. Our support canes are white and red to show people that you have low vision. There are different types of tips for the long canes – pencil tips, rolling tips, marshmallow and ball tips. The best tip for your cane depends on your cane technique and where you use the cane. During assessment and training our qualified instructors will demonstrate the tips so you can choose the best one for you. The Blind Foundation’s online shop has a range of canes to choose from. Visit the Shop to find out what’s available and how to get a referral for assessment and training. You can also call us on 0800 24 33 33 or email generalenquiries@blindfoundation.org.nz to find out more.